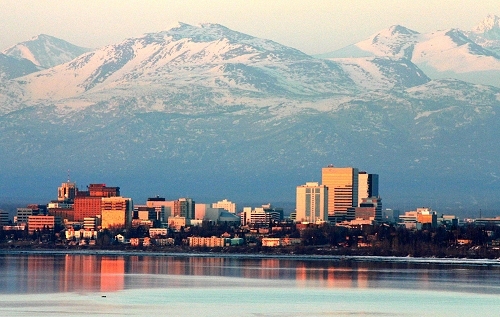 Anchorage, the largest city in Alaska, is located in southcentral Alaska at the head of Cook Inlet. It is 3 hours' flight time from Seattle. It lies at approximately 61° 13' N Latitude, 149° 53' W Longitude (Sec. 28, T013N, R004W, Seward Meridian). The community is located in the Anchorage Recording District. The area encompasses 1,698 sq. miles of land and 264 sq. miles of water. In 1741 Russian sailors led by the Dane Vitus Bering came upon Alaska's mainland. They were followed by British, Spanish and American explorers, including Captain James Cook in 1778. In 1867, Alaska was purchased by the U.S. from Russia. The discovery of gold in 1887 and in the Interior in 1922 sparked development in the area. Construction began in 1914 on a federal railroad from the port of Seward, 126 miles south of Anchorage, through the coal fields of Interior Alaska, to the gold claims near Fairbanks, 358 miles to the north. The midpoint construction headquarters was Anchorage, and by July of 1915, thousands of job seekers and opportunists had poured into the area, living in a tent city on the banks of Ship Creek near the edge of the present downtown. That July produced the "Great Anchorage Lot Sale," a land auction that shaped the future of the city. Some 655 lots were sold for $148,000 or an average of $225 each. A month later, the town voted to call itself Alaska City, but the Federal government refused to change its name from Anchorage. From 1939 to 1957, major military impacts and government construction of roads, airports and harbors throughout Alaska contributed to the growth of Anchorage. The Port was completed by the early 1960s. The Good Friday earthquake in 1964 destroyed a large part of the city. During the 1970s, the development of the Prudhoe Bay oil fields and the Trans-Alaska Pipeline brought rapid growth to Anchorage; population, office space and housing tripled within a ten-year period.